No one can forget the feelings we all had that morning when the twin towers in NY came down. Each of us experienced it in a different way, depending on many factors, but there was a common spirit with all of us that day, even if it was for only a short period of time. Life goes on, and remembering tragic experiences such as 911 seem to feel less and less emotional as we all get on with our life in the best way we can. It is a necessary thing to do, and time eases much of the pain these sorts of things cause us. 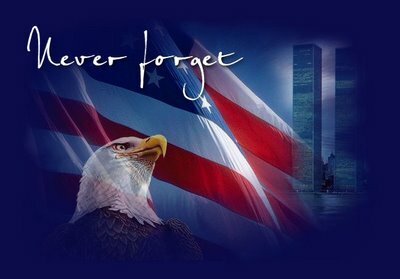 We don't discuss the day as often as we did, but we do remember. As I sat to write this blog posting, I put my thoughts into a poem. It expresses much of what I felt then and still feel now. Many things have been said over the last 11 years but these words still seem to say what I feel best. "If we learn nothing else fro this tragedy, we learn that life is short and there is no tie for hate." said Sandy Dahl, the wife of Flight 93 pilot Jason Dahl. 11 years ago, my day seemed oddly to stand still. A vision haunts me now, and surely always will. were falling to the ground, and not a person knew just why. Much time has passed since then, and life has moved ahead. The routine part of life takes precedence over those dead. How could this thing have happened? What brought this as our fate? Why does another person become filled with intense hate? The answers to these questions see illusive to us all. We still keep on inquiring why those towers took that fall. We'll never know the answers. We will always wonder why. And we'll always have reactions as we gaze into the sky. to make it be a certainty that we do not forget. Thank you for sharing your beautiful poem with us. beautifully written..so sad that we all have this day in common..hope the world learns from it and one day maybe we will see peace.. Thanks Carol for sharing you thoughts in a well written poem! My husband is a poet too! I will have to share this with him. Your poem touched me. You are talented in so many ways. And I am touched by your comment Linda. thanks! I find writing and reading poetry to be cathartic. Thank you. Thank you for the lovely comment MCatherine. thank you for much for taking the time to post your kind words.